Uses: Art Display, College Lengths: 9 panel 16'-9" Heights: 8'-0"
Customer feedback is very important to Screenflex. It’s how we learn, grow, and celebrate. Recently, one of our sales consultants received this wonderful picture and comment from the Western Oregon University staff regarding their Screenflex art display panels. “I wanted to let you know that we LOVE our Screenflex wall divider! My students like having another option for showing their artwork, especially one that can be moved anywhere on campus. Already, we’ve had three “pop-up” art shows using the wall. Thanks for everything!” – University Staff. We are so pleased that the students can use the divider to showcase their hard work. 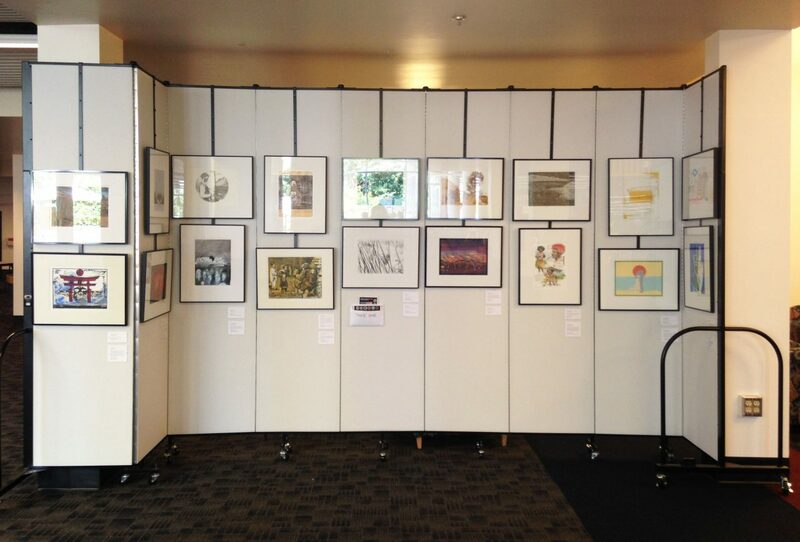 And since the dividers roll on wheels, the “pop-up” art show can be set up anywhere on campus.